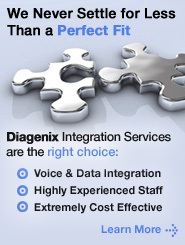 Diagenix is an innovative voice application company with over 25 years of industry expertise and knowledge in providing packaged & custom voice applications, standards-based platforms, servers, tools, and hosted outsourcing services that enable companies of all sizes to quickly and efficiently provide anytime, anywhere, access to information and transactions over the telephone. We have helped companies from coast-to-coast to reduce costs and improve service by applying solid business practices coupled with proven technologies. We offer vendor-agnostic voice applications and solutions that are rich in functionality, easy to use and customize, straightforward to integrate, quick to deploy, effortless to maintain, and reasonably priced. Founded in 1988, Diagenix is a privately held company with its headquarters located in Norwell, Massachusetts. Its products and services are sold through a dedicated sales force and selected business partners. Integrity.—It is our belief that nothing is more important to an individual or a business than integrity. Treating others with honesty, and fairness, and in the manner that we would like to be treated will always be our core guiding principle. Professionalism.—Diagenix believes that professionalism is much more than how we look or behave. Professionalism is doing things right the first time, paying attention to details, and striving for quality in everything we do. Accountability.—Diagenix believes that both as a business and as individuals we must accept responsibility for completing assigned tasks and the quality of our work. It is our belief that while we cannot commit to never making mistakes, we can commit to correcting them immediately if they occur. Fairness.—Diagenix believes in treating everyone fairly and evenly. While this does not always mean that everyone can be treated exactly the same in all circumstances, we strive to be fair to all individuals both inside and outside the organization. Leadership.—We believe that true leaders operate for the good of the business and the individuals in it. Leadership is not tied to a position or job description. Leadership at all levels is using the company's principles in decisions, actions and motives to accomplish the businesses objectives. Term orientation.—Diagenix strives for long-term and permanent success and achievement of our goals. Our perspective must be forward looking, and must balance short term needs with long term objectives. Conserving, reusing, and recycling.—When it is feasible, Diagenix conserves natural resources by using recycled materials and supplies, efficiently using energy, and participating in recycling programs for Diagenix products after they have served their useful life. Diagenix encourages and supports the sustainable use of renewable natural resources. Reducing and disposing of waste.—Diagenix reduces and where possible eliminates waste through source reduction and recycling at company facilities. All waste is safely and responsibly handled and disposed of. Does Diagenix focus on one industry or multiple industries?